DUG Insight User ManualDUG Insight User ManualDUG Insight 4 User Manual Coordinate Reference System (CRS)How do I create a custom coordinate reference system (CRS)? A coordinate reference system (CRS) the relationship between Cartesian and Geodetic coordinates. Insight uses these relationship to transform coordinates accurately. 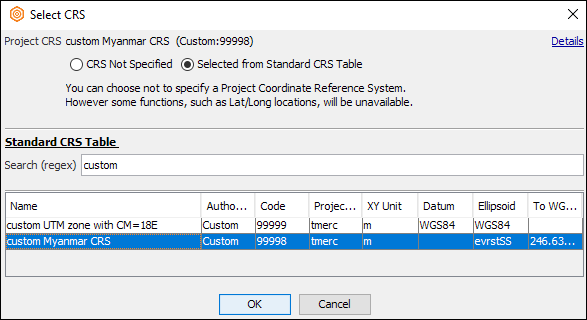 Insight includes thousands of CRS definitions, available through the CRS selection table (see the Select a project CRS section in Creating a Project or Configuring project CRS section in Configure a Project). The CRS definitions are sourced from the well regarded Spatial Reference Database: http://spatialreference.org. We make efforts to update the list on a regulatr basis, but reference systems are created and updated to better server different areas. In cases where a specific CRS is not available, a custom one can be created. 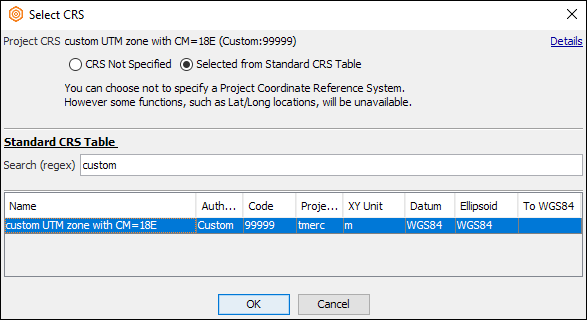 Custom CRS definitions must be stored in a file named, "customcrs.txt" and placed in the project directory. The file contains projection and transformation parameters to define one (or more) coordinate reference systems. Insight uses the Proj4 CRS definition format. Full details about Proj4 definition can be found here: https://github.com/OSGeo/proj.4/wiki/GenParms. a single line defining the CRS. These example parameters define a transformation between UTM Cartesian Coordinates (with a Central Meridian at 18E) and WGS84 Geodetic Coordinates. +units = meters, US survey feet, etc. Once created, save the customcrs.txt file in the Insight project directory. The custom CRS will be listed in the CRS selection table in Insight. Other parameters and their required syntax can be found in the Proj4 general parameters website: https://github.com/OSGeo/proj.4/wiki/GenParms. Note: Remember to use a unique identifier for each custom CRS in the file and no empty line between each parameters. Because CRS transformations have such a large impact on your data, we strongly recommend carefully checking all custom CRS transformations. To do this, use points in the custom CRS that have known, correct locations in another CRS, convert them and compare the results. Contact support@dugeo.com for details on how to do this. If you are unsure about creating custom CRS definitions, please send the details to support@dugeo.com and we will create a customcrs.txt file for you.